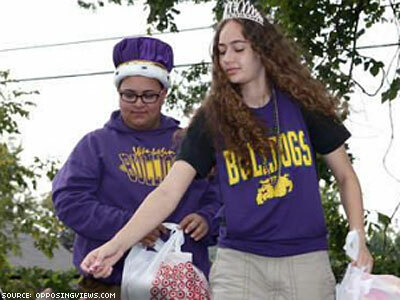 Waukegan High School crowned gay students Eric Irizarry and Ariana Reiff as homecoming king and queen. A high school in Illinois has chosen a gay student for its homecoming king and a lesbian student for its homecoming queen. Eric Irizarry and Ariana Reiff, who both identify as gay, expressed surprise at their election as homecoming royalty at Waukegan High School, a four-year public school with over 4,000 students. Administrators verified that the election is by popular vote and said the choice of two openly gay students as homecoming king and queen is a testament to the tolerance and open-mindedness of its student body. “Our students are very accepting of each other’s differences in a great variety of ways,” Steven Hamlin, director of the school’s Washington campus, told the News-Sun. The close friends were crowned at the school’s homecoming football game last Saturday.